Morgan St. James's book Vanishing Act in Vegas was available from LibraryThing Early Reviewers. Morgan St. James's book Writers' Tricks of the Trade: 39 Things You Need to Know About the ABCs of Writing Fiction was available from LibraryThing Early Reviewers. Morgan St. James's book The Devil's Due - Book 2 was available from LibraryThing Early Reviewers. Morgan St. James's book Devil's Dance - Book 1 was available from LibraryThing Early Reviewers. Morgan St. James's book VANISHING ACT IN VEGAS was available from LibraryThing Member Giveaway. 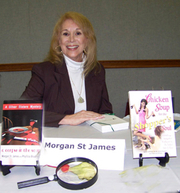 Morgan St. James is currently considered a "single author." If one or more works are by a distinct, homonymous authors, go ahead and split the author. Morgan St. James is composed of 4 names. You can examine and separate out names.